Submitted by peter on 12 November, 2008 - 13:40. 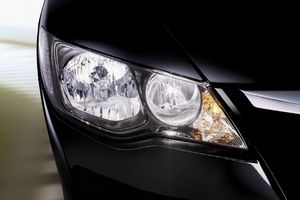 Coming so soon after the launch of the much hyped Honda City, the 2009 Honda Civic facelift slipped in a week ago and there has been very little said. Of course that could have something to do with the fact that you would be hard pushed to notice the difference between the updated 2009 Civic, and the model it has replaced. The Honda Civic is the first sedan in its segment to offer touch-screen navigation system. This is cool, but it adds THB65,000 onto the price tag. The Honda Civic is also the first sedan in its segment to push the prices out to over THB 1.1 million baht for the top spec model. Facelifts by definition require some sort of cosmetic changes to take place on the exterior. And although Honda has gone to the expense and bother of redesigning some parts, the changes are very subtle. The grille now features a chrome insert that actually looks dated given the designs of the rest of the Honda line-up at this stage. The front bumper is also re-styled slightly, and the lights, front and rear, are tweaked slightly. The rear lights now featuring a more square look to the internal clusters, which are not octagonal rather than round. I have to admit this is kinda nice looking. Honda claim that these changes help to reinforce the Civic’s sportier image, and helps them to target young professionals. Well, that's it really. The touch-screen navigation system is obviously the big draw, and Honda will be hoping that this will swing a few customers their way. This system also features a DVD player. The pricing starts from THB 749,000 and goes all the way up to THB 1,101,000 for the top spec model. The cheapest model to have the navigation system is the 1.8 E (AS) NAVI which will set you back THB 964,000! No changes have been made to the engines, with the 1.8-litre producing 140 horsepower and the 2.0-litre engine putting out 155 horsepower. Given that Honda already has a comfortable lead on the power stakes, it's hardly surprising that things remain the same here. Standard features include the Civic’s Multiplex Meter with self-illuminating meters, Immobiliser and security alarm systems, and dual tail pipes. If you are interested in safety, you can forget all the lower end models, and jump straight to the 1.8 S (AS) which sets you back THB 831,000 and includes automatic transmission with dual airbags. The Civic 1.8 E (THB 909,000) comes with a new audio remote control on the steering wheel and door mirrors with side turn signals. The Civic 1.8 E Navi (THB 964,000) is equipped with the touch-screen navigation system and DVD player, cruise control and audio remote control on steering wheel. 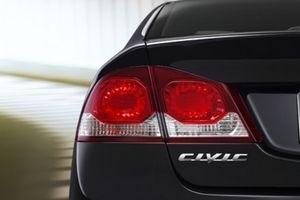 The Civic 2.0 EL (THB. 1,046,000) has rear parking sensors, paddle shift, cruise control, automatic air-condition, audio remote control on leather steering wheel, and 17-inch alloy wheels. The top-end Civic 2.0 EL Navi (THB 1,101,000) features a touch-screen navigation system, DVD player, and rear parking sensors. 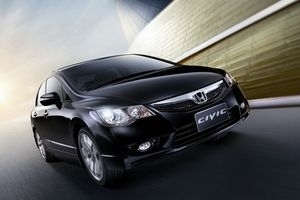 Honda will be showing the 2009 Civic at the upcoming Motor Expo (29 November – 10 December). But you can book it now!